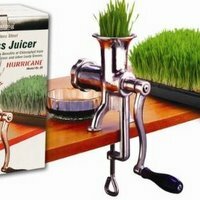 Juices wheatgrass and barley grass. Easy to clean and mounts on a countertop. It has few parts to wash and assemble, it will never rust, and it will last you a lifetime. Appliance Warranty 5 Years This juicer has a longer than average limited appliance warranty. Again, the warranty is a good indicator of overall durability. Star Rating 4.4 User reviews, ratings, and feedback indicates that this juicer is rated higher than average by 14 users and ranks in the top 29% of juicers.